Description of "A Blind Man's Bluff"
Is it ever too late to be good for Christmas? Aaron George is at a pub in Bangalore, three days before Christmas. He notices Julia at the bar counter, a woman who is at least a thousand leagues out of his reach. Sparks fly, conversations happen and then, a girl walks into a bar and all hell breaks loose. Julia and Aaron are now on the run from a mysterious foe who always seems to be one step ahead of them. Forced to revisit their pasts, Julia and Aaron must now fight to stay alive. As they are pushed blindly from pillar to post, running for their lives and coming face to face with their own fears and insecurities, they will need a miracle to get past Christmas. Arun George is an amateur writer and filmmaker. Born and raised in Thrissur, Kerala, he started writing at the age of 13 for school level competitions. He completed his Bachelor of Arts in Communication, English and Psychology from Christ University, Bengaluru in 2016 and is currently finishing his Master of Business Administration (Finance Management) from CHRIST (Deemed to be University), Bengaluru. He has participated in four NaNoWriMo challenges and has won three of them. This is his second published novel. He has made 12 short films and has won awards at various short film festivals. He is the founder of and director at Imaginarium Productions. 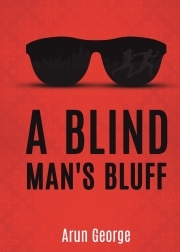 Reviews of "A Blind Man's Bluff"